For other people named Roger Sherman, see Roger Sherman (disambiguation). Roger Sherman (April 19, 1721 – July 23, 1793) was an early American statesman and lawyer, as well as a Founding Father of the United States. He is the only person to have signed all four great state papers of the United States: the Continental Association, the Declaration of Independence, the Articles of Confederation, and the Constitution. Born in Newton, Massachusetts, Sherman established a legal career in Litchfield County, Connecticut despite a lack of formal education. After a period in the Connecticut House of Representatives, he served as a Justice of the Superior Court of Connecticut from 1766 to 1789. He represented Connecticut at the Continental Congress and signed the Continental Association, which provided for a boycott against Britain following the imposition of the Intolerable Acts. He was also a member of the Committee of Five that drafted the Declaration of Independence. He later signed both the Articles of Confederation and the United States Constitution. In 1784, he was elected as the first mayor of New Haven, Connecticut. Sherman served as a delegate to the 1787 Philadelphia Convention, which produced the United States Constitution. After Benjamin Franklin, he was the oldest delegate present at the convention. He favored granting the federal government power to raise revenue and regulate commerce, but initially opposed efforts to supplant the Articles of Confederation with a new constitution. He ultimately came to support the establishment of a new constitution, and proposed the Connecticut Compromise, which won the approval of both the larger states and the smaller states. After the ratification of the Constitution, Sherman represented Connecticut in the United States House of Representatives from 1789 to 1791. He served in the United States Senate from 1791 to his death in 1793. Sherman was born into a farm family located in Newton, Massachusetts, near Boston. His father was William and mother Mehetabel Sherman. Mehetabel's father was Benjamin Wellington and her mother was Elizabeth Sweetman, whose christening date was March 4, 1687 (or 1688), and she died on April 12, 1776. William and Mehetabel had seven children, William Jr., Mehetabel, Roger (1721), Elizabeth (married James Buck), Nathaniel (became a Reverend), Josiah (also became a Reverend), and Rebecca (married Joseph Hartwell Jr.). After Elizabeth was born (1723), the Shermans left Newton and settled in the south precinct of Dorchester, that three years later became the township of Stoughton and located 17 miles (27 km) south of Boston, when Roger was two. William married Rebecca Cutler on July 15, 1714. Josiah was Chaplain of the 7th Connecticut from January 1 to December 6, 1777. The part of Stoughton where Sherman grew up became part of Canton in 1797. Sherman's education did not extend beyond his father's library and grammar school, and his early career was spent as a shoe-maker. However, he had an aptitude for learning, and access to a good library owned by his father, as well as a Harvard-educated parish minister, the Rev. Samuel Dunbar, who took him under his wing. In 1743, due to his father's death, Sherman moved (on foot) with his mother and siblings to New Milford, Connecticut, where in partnership with his brother William (wife Ruth), he opened the town's first store. He very quickly introduced himself in civil and religious affairs, rapidly becoming one of the town's leading citizens and eventually town clerk of New Milford. Due to his mathematical skill he became county surveyor of New Haven County in 1745, and began providing astronomical calculations for almanacs in 1759. Roger Sherman was married two times and had a total of fifteen children with thirteen reaching adulthood. Sherman married Elizabeth on November 17, 1749. She was born August 31, 1726, in Stoughton, her father was Deacon Joseph Hartwell (born August 11, 1698, died February 6, 1786) and her mother was Mary Hartwell (née Tolman), who was born on October 4, 1697, and died on November 10, 1782. They were married by Samuel Dunbar and had seven children. Elizabeth died on October 19, 1760. Sherman married Rebecca (also spelled Rebekah) Prescott on May 12, 1763. She was born on May 20, 1742, in Danvers, Essex County, Massachusetts. They had eight children, Rebecca; married and then Elizabeth; married same Simeon Baldwin, Roger, Mehetabel (1st), Mehetabel (2nd); married Jeremiah Evarts, Oliver, Martha; married Jeremiah Day, and Sarah; married Samuel Hoar. The first Mehitabel and Oliver both died in infancy. Rebecca died in August 1814. A son, Roger Sherman Jr. (1768–1856), a 1787 graduate of Yale College served in the Connecticut General Assembly in 1810–1811. A daughter, Rebeca Sherman, was married to Simeon Baldwin, whose career included service in the United States Congress (1803–1806), as an Associate Judge of the Connecticut Superior Court, 1806–1817, and who became Mayor of New Haven, Connecticut, in 1826. Following the death of Rebecca Sherman, Baldwin married another of Roger Sherman's daughters, Elizabeth Sherman Burr. His daughter, Mehetabel Sherman Barnes married Jeremiah Evarts, who served as treasurer and secretary of the American Board of Commissioners for Foreign Missions. His daughter Martha Sherman married Jeremiah Day, who was President of Yale University from 1817 to 1846. Another daughter, Sarah Sherman, married Samuel Hoar, who was a member of the Massachusetts state legislature and the U.S. Congress. Grandfathers before Henry Sherman (the older) were Thomas (10th generation), John (9th generation), and Thomas Sherman (8th generation). Henry Sherman (the older or 1st) born about 1512, married Agnes around 1539 (whose father may have been Thomas Butter) died October 14, 1580, in Dedham, England. Joseph Sherman: grandfather, born on May 14, 1650, and died 1731, married Elizabeth Winship on April 12, 1676. 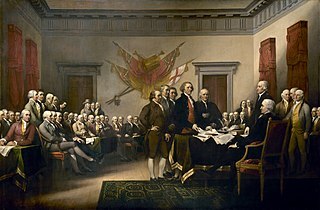 The Declaration of Independence by John Trumbull depicts the Committee of Five (Sherman is the second person on the left) presenting its work to Congress. Sherman is especially notable in United States history for being the only person to sign all four great state papers of the United States, the United States Declaration of Independence, the Articles of Association, the Articles of Confederation, and the United States Constitution. Robert Morris, who did not sign the Articles of Association, signed the other three. John Dickinson also signed three, the Continental Association, the Articles of Confederation and the United States Constitution. He was involved with the Declaration of Independence but abstained, hoping for a reconciliation with Britain. Despite the fact that Sherman had no formal legal training, he was urged to read for the bar exam by a local lawyer and was admitted to the Bar of Litchfield, Connecticut in 1754, during which he wrote A Caveat Against Injustice and was chosen to represent New Milford in the Connecticut House of Representatives from 1755 to 1758 and from 1760 to 1761. Sherman was appointed justice of the peace in 1762 and judge of the court of common pleas in 1765. During 1766, Sherman was first elected to the Governor's Council of the Connecticut General Assembly, where he served until 1785. Sherman served as Justice of the Superior Court of Connecticut from 1766 to 1789, when he left to become a member of the United States Congress. Sherman was also appointed treasurer of Yale College, and awarded an honorary Master of Arts degree. He was a professor of religion for many years, and engaged in lengthy correspondences with some of the theologians of the time. During February 1776, Sherman, George Wythe, and John Adams were members of a committee responsible for establishing guidelines for U.S. embassy officials in Canada with the committee instructions that included, "You are to declare that we hold sacred the rights of conscience, and may promise to the whole people, solemnly in our name, the free and undisturbed exercise of their religion. And ... that all civil rights and the rights to hold office were to be extended to persons of any Christian denomination." In 1784 he was elected Mayor of New Haven, which office he held until his death. In 1790 both Sherman and Richard Law were appointed to revise the confused and archaic Connecticut statutes, which they accomplished. Throughout his life, Sherman was a major benefactor of Yale College, acting as the university's treasurer for many years and promoting construction of a college chapel. Roger Sherman died in 1793. Roger Sherman was one of the most influential members of the Constitutional Convention. He is not well known for his actions at the Convention because he was a "terse, ineloquent speaker" who never kept a personal record of his experience, unlike other prominent figures at the convention such as James Madison, and at 66 years of age, Sherman was the second eldest member at the convention following Benjamin Franklin (who was 81 years old at the time). Yet as one of the most active members of the Convention, Sherman made motions or seconds in reference to the Virginia Plan 160 times. His opponent Madison made motions or seconds 177 times. Roger Sherman came into the Convention without the intention of creating a new constitution. Sherman, an original signer of the Articles of Confederation, saw the convention as a means to modify the already existing government. Part of his stance was concerned with the public appeal. He defended amending the articles declaring that it was in the best interest of the people and the most probable way the people would accept changes to a constitution. Sherman saw no reason for a bicameral legislature, as proposed by the Virginia Plan. "The problem with the old government was not that it had acted foolishly or threatened anybody's liberties, but that it had simply been unable to enforce its decrees". Sherman further advanced the idea that the national government simply needed a way to raise revenue and regulate commerce. Sherman was a big defender of a unicameral legislature. He defended the unicameral legislature of the Articles of Confederation by stating that the large states had not "suffered at the hands of small states on account of the rule of equal voting". Ultimately, when Sherman saw his initial goals of the convention as unattainable he organized compromises and deals in order to enact some of his desirable legislation. Sherman was from a particularly isolationist state – Connecticut operated almost without much need from other states, using its own ports to trade with the West Indies instead of utilizing ports in Boston – and feared that "...the mass of people lacked sufficient wisdom to govern themselves and thus wished no branch of the federal government to be elected directly by the people". Sherman, Elbridge Gerry (himself later recognized as the namesake of American political gerrymandering) and others were of the shared opinion that the elected composition of the national government should be reserved for the vote of state officials and not for election by the will of the people. Sherman was wary of allowing ordinary citizen participation in national government and stated that the people "should have as little to do as may be about the Government. They want information and are constantly liable to be misled". The two proposed options for the formation of the legislative branch emerged in the deliberations. One was to form a bicameral legislature in which both chambers had representation proportional to the population of the states, which was supported by the Virginia plan. The second was to modify the unicameral legislature that had equal representation from all of the states, which was supported by the New Jersey plan. Roger Sherman was a devout supporter of a unicameral legislature, but when he saw that goal as unattainable he motioned to compromise. In terms of modes of election "Sherman moved to allow each state legislature to elect its own senators". Additionally, in the house Sherman originally proposed that the suffrage of the House of Representatives should be figured according to the "numbers of free inhabitants" in each state. During the Constitutional Convention of 1787, summoned into existence to amend the Articles of Confederation, Sherman and Oliver Ellsworth offered what came to be called the Great Compromise or Connecticut Compromise. In this plan, designed to be acceptable to both large and small states, the people would be represented proportionally in one branch of the legislature, called the House of Representatives (the lower legislative house). The states would be represented in another house called the Senate (the upper house). In the lower house, each state had a representative for every one delegate. In the upper house each state was guaranteed two senators, regardless of its size. Sherman is also memorable for his stance against paper money with his authoring of Article I, Section 10 of the United States Constitution and his later opposition to James Madison over the "Bill of Rights" amendments to the U.S. Constitution in his belief that these amendments would diminish the role and power of the states over the people. Mr. Wilson & Mr. Sherman moved to insert after the words "coin money" the words "nor emit bills of credit, nor make any thing but gold & silver coin a tender in payment of debts" making these prohibitions absolute, instead of making the measures allowable (as in the XIII art) with the consent of the Legislature of the U.S. ... Mr. Sherman thought this a favorable crisis for crushing paper money. If the consent of the Legislature could authorize emissions of it, the friends of paper money would make every exertion to get into the Legislature in order to license it." In terms of the executive Sherman had very little interest in giving the executive much authority. Sherman suggested that no constitutional provision needed be made for the executive because it was "nothing more than an institution for carrying the will of the Legislature into effect". Originally opposed to slavery due to his personal beliefs and puritan views, Sherman used the issue of slavery as a tool for negotiation and alliance. Sherman was of the opinion that slavery was already gradually being abolished and the trend was moving southward. Sherman saw that the issue of slavery could be one that threatened the success of the constitutional convention. Therefore, Sherman decided to help pass legislation to benefit slave states in order to obtain unlikely allies from South Carolina. The two forces joined together because they both, due to the economies of their home states, benefitted from there being no export tax. Sherman opposed appointment of fellow signer Gouverneur Morris as minister to France because he considered that high-living Patriot to be of an "irreligious nature". Sherman was instrumental in securing the addition of "or to the people" in the wording of the Tenth Amendment to the United States Constitution, and caused the cent to be used in the financial system. In a letter to Oliver Wolcott (May 21, 1777) he wrote, "I think it dangerous to admit citizens not connected to the army to be tried by a Court Martial". Sherman died in his sleep on July 23, 1793, after a two-month illness diagnosed as typhoid fever. The Gazette of the United States (Philadelphia, Pennsylvania), August 17, 1793, p. 508, reported an alternate diagnosis, "He was taken ill about the middle of May last, and from that time declined till his death. His physician supposed his disorder to be seated in his liver." He was buried in New Haven Green. In 1821, when that cemetery was relocated, his remains were moved to the Grove Street Cemetery. Numerous of Roger Sherman's descendants achieved prominence. A son, Roger Sherman, Jr. (1768–1856), a 1787 graduate of Yale College, served in the Connecticut General Assembly in 1810–1811. His nephew Roger Minott Sherman served as a Connecticut State Representative, 1798; Connecticut State Senator (CT), 1814–1818; and as Judge of the Connecticut Supreme Court, 1840–1844. His daughter Rebecca Sherman was married to Simeon Baldwin, US Representative from Connecticut, 1803–1806, and an Associate Judge of the Connecticut Superior Court, 1806–1817, and who later became Mayor of New Haven, Connecticut, in 1826. Following the death of Rebecca Sherman, Baldwin married Rebecca's sister Elizabeth Sherman Burr. Daughter Martha was married to Jeremiah Day who was the President of Yale University from 1817 to 1846. Daughter Mehitabel Sherman was to married Jeremiah Evarts who was secretary of the American Board of Commissioners for Foreign Missions. His daughter Sarah Sherman was married to Samuel Hoar, who was a member of the Massachusetts state legislature and U.S. Representative from Massachusetts 1835–1837. Three grandsons Roger Sherman Baldwin, George F. Hoar, and William M. Evarts all served in the U.S. Senate. Baldwin also served as Governor of Connecticut. Evarts also served as United States Secretary of State and United States Attorney General, he was succeeded in that office by a fourth Sherman grandson who served as Massachusetts Supreme Court Chief Justice and United States Attorney General Ebenezer R. Hoar, who was also the brother George F. Hoar. A fifth grandson Sherman Day served in the California State Senate, 1855–1856; was United States Surveyor General, California, 1868–1871; and was an original trustees of the University of California. Great-granddaughter Elizabeth Thacher Kent was an environmentalist and women's suffrage activist. Kent was married to William Kent, U.S. Representative from California 1913 to 1917, who authored the bill establishing the National Park Service and donated the land for Mount Tamalpias State Park and Muir Woods. Great-great-great grandson Theodore Sherman Palmer was also an environmentalist, serving as the vice-president of the American Society of Mammalogists from 1928 to 1934, and a co-founder of the National Audubon Society. Great-granddaughter Elizabeth Follansbee was the first woman appointed to a medical school faculty in California, and practiced in Los Angeles from 1883 until soon before her death in 1917. Great-grandson Simeon Eben Baldwin was a justice of Connecticut state supreme court, 1897–1907; chief justice of Connecticut Supreme Court, 1907–1910; Governor of Connecticut, 1911–1915; candidate for Democratic nomination for President, 1912; and candidate for U.S. Senator from Connecticut, 1914; Henry Sherman Boutell was a U.S. Representatives from Illinois, 1903–1911; Roger Sherman Greene was an associate justice of the Supreme Court of Washington Territory, 1870–1879; Sherman Hoar was a U.S. Representative from Massachusetts, 1891–1893; Rockwood Hoar was a U.S. Representative from Massachusetts, 1905–1906; Edward Baldwin Whitney, was a justice of the First District New York State Supreme Court, 1909–1911; and Sherman Day Thacher was the founder and first headmaster of the elite private boarding school The Thacher School in Ojai, California. Great-great-grandsons Roger Kent was Chairman of the California Democratic State Central Committee; and Sherman Kent was one of the founders of the Central Intelligence Agency, pioneering many methods of intelligence analysis. See Sherman Kent School for Intelligence Analysis; and another Roger Sherman Hoar was a Massachusetts state senator and assistant Attorney General. Husband of his great-great-granddaughter Mabel Wellington White, Henry L. Stimson was Secretary of War under President Taft, Secretary of State under President Hoover, and Secretary of War under both Presidents Roosevelt and Truman. Stimson was the major decision-maker on the atomic bomb and both Presidents followed his advice about using it as the weapon that led to the ultimate end of World War II. Mabel's sister Elizabeth Selden Rogers was chairman of the Advisory Council of the National Woman's Party and its Legislative Chairman for New York, and was one of the most forceful speakers in the "Prison Special" bus tour across the country; during which suffragists spoke of their experience in jail. Rogers was arrested, as part of the Silent Sentinels protest, on July 14, 1917, for picketing in front of the United States White House, and was sentenced to sixty days in Occoquan Workhouse in Virginia; but she was quickly pardoned by U.S. President Woodrow Wilson after just three days. Great-great-great grandson Archibald Cox served as a U.S. Solicitor General and special prosecutor during President Richard Nixon's Watergate scandal; he was the great-grandson of William M. Evarts. Sherman Avenue in central Madison, Wisconsin. Note: Most of the main streets in downtown Madison are named after signers of the United States Constitution. Roger Sherman Street in Orange Park, Florida Heritage Hills neighborhood. ^ Roger Sherman Architect of the Capitol. Retrieved February 14, 2007. ^ a b c d e f Collier, Christopher, and James Lincoln Collier. Decision in Philadelphia: The Constitutional Convention of 1787. New York: Random House, 1986. Print. ^ Roger Sherman's family: The Society of the Descendants of the Signers of the Declaration of Independence. Retrieved 2016-05-13. ^ Rev. Josiah Sherman: From Archive.org, p. 364. ^ Sherman genealogy, including families of Essex, Suffolk and Norfolk, England, p. 142; published 1920, author Sherman, Thomas Townsend (born 1853). Retrieved 2016-05-16. ^ Elizabeth Hartwell Sherman- American History by the University of Groningen: Retrieved 2016-05-21. ^ Sherman genealogy, including families of Essex, Suffolk and Norfolk, England, p. 150; published 1920, author Sherman, Thomas Townsend (born 1853). Retrieved 2016-05-17. ^ Rebecca Sherman Book: Sherman genealogy, including families of Essex, Suffolk and Norfolk, England, pp. 153–154; 1920, author Sherman, Thomas Townsend (born 1853). Retrieved 2016-05-21. ^ Sherman genealogy, including families of Essex, Suffolk and Norfolk, England, p. 141; published 1920, author Sherman, Thomas Townsend (born 1853). Retrieved 2016-05-16. ^ New England Historical and Genealogical Register (New England Historic and Genealogical Society), 2012, Vol. 166, pp. 245–259. ^ Agnes: The American Genealogist, New Haven, Connecticut: D. L. Jacobus, 1987, Vol. 62, p. 77. Retrieved 2016-05-16. ^ Sherman genealogy, including families of Essex, Suffolk and Norfolk, England, p. 121; published 1920, author Sherman, Thomas Townsend (born 1853). Retrieved 2016-05-16. ^ a b Robertson, David B. "Madison's Opponents and Constitutional Design." The American Political Science Review 99.22 (2005): 225–243. JSTOR. Web. February 11, 2015. ^ a b Boyd, Julian P. "Roger Sherman: Portrait of a Cordwainer Statesman." The New England Quarterly 5.2 (1932): 221–236. JSTOR. Web. February 12, 2015. ^ a b c d Rakove, Jack N. Original Meanings: Politics and Ideas in the Making of the Constitution. New York: A.A. Knopf, 1996. Print. ^ Farrand, Max, ed. The Records of the Federal Convention of 1787. ^ Sherman genealogy, including families of Essex, Suffolk and Norfolk, England, p. 187; published 1920, author Sherman, Thomas Townsend (born 1853). Retrieved 2016-05-17. ^ Rommel, John G. (1979). 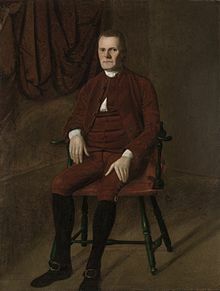 Connecticut's Yankee patriot, Roger Sherman. Hartford: American Revolution Bicentennial Commission of Connecticut. p. 53. ISBN 0-918676-20-7. ^ Boardman (1938). : Signer and Statesman. University of Pennsylvania Press. p. 336. Gerber, Scott D., "Roger Sherman and the Bill of Rights." Polity 28 (Summer 1996): 521–540. Rommel, John G., Connecticut's Yankee Patriot: Roger Sherman, Hartford: American Revolution Bicentennial Commission of Connecticut, 1980. United States Congress. "Roger Sherman (id: S000349)". Biographical Directory of the United States Congress. Chisholm, Hugh, ed. (1911). "Sherman, Roger" . Encyclopædia Britannica (11th ed.). Cambridge University Press.